New Arrival to our Brokerage.This is a 2018 Grady-White Freedom 215 Dual Console with a Yamaha F250XB 4-stroke engine.  This One Owner boat only has 52 hours and this package was Sold and Serviced by Boats Inc. Since New. Electronics Package includes a Garmin 761 XSV MFD w/ Chirp Transducer, ICOM M324 VHF, Fusion Stereo. Option are Seaport Blue Gel Coat Hull Color, Deluxe Helm Chair #2 (STBD),Lounge Seat-Port with Sliding Backrest, Hydraulic Trim Tabs, Ski Pylon, Cockpit Shower, Raw Water Wash Down, Raw Water Livewell, Engine Flush, Black Vista Top with Front and Side Curtains, Black Vista Top Drop Curtain, Black Bow Well Cover and more. We are Open 7 Days A Week for your convenience, so call or stop by today for a quote.